When sharing the streets with vehicles, pedestrians and bicyclists are particularly vulnerable. If you or a loved one has been injured in a bicycle or pedestrian accident, don’t allow that lopsided “man vs. machine” vulnerability to carry over to your dealings with insurance adjusters whose job it is to get you to settle for the lowest possible dollar figure. Do not grant them that power. We will work to help you make a fair monetary recovery for your pain and suffering, medical expenses, loss of income, disfigurement, loss of normal life, and any other losses sustained in the accident. Let the experienced professionals of Inserra | Kelley | Sewell, Injury Attorneys stand with you to protect your right to fair treatment and fair compensation. 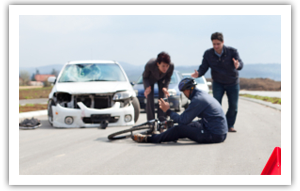 Bicycle/Truck Accidents: Am I in the blind spot? Do Bicycle Lanes Help Prevent Serious Injuries?